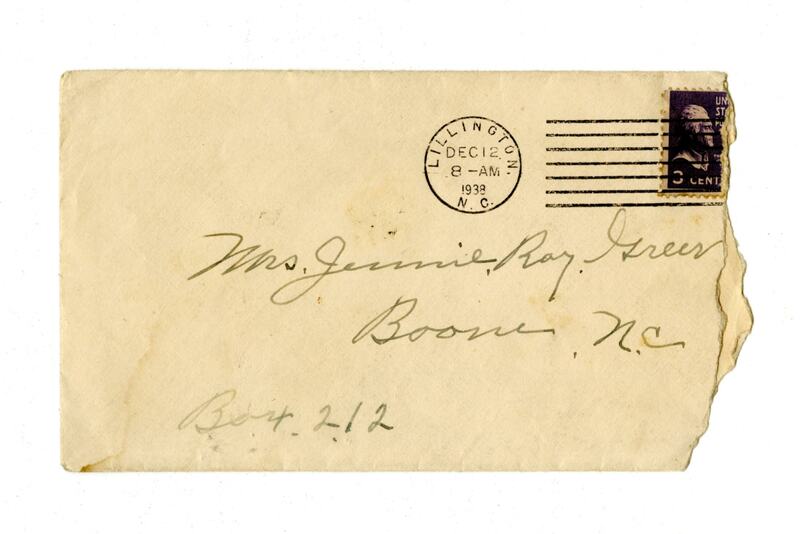 Handwritten letter from Cale Greer (sent from Lillington, NC) to Jennie Ray Greer, Boone, NC, including envelope postmarked December 12, 1938. 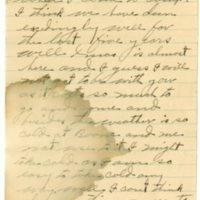 Cale Greer describes having only 78 more days left in camp--possibly a Civilian Conservation Corps assignment--as he nears the end of a two-year assignment. W. C. "Cale" Greer (sometimes rendered as "Cole") also mentions a total of five years spent working in the camps. Lillington, NC, was the nearest post office to Company 2431-V's camp (a World War I veterans camp) in the "Avery city limits" (Project SCS-22, a Soil Conservation Service project), which was established in July 1935. 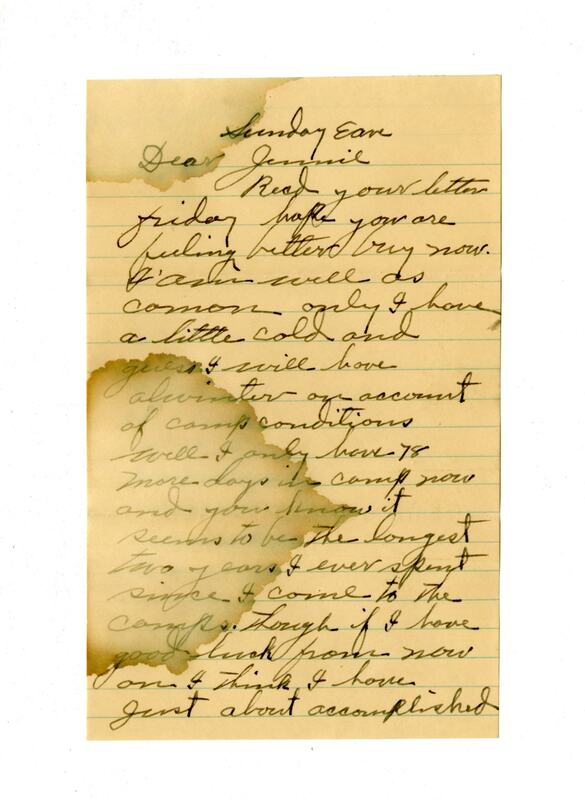 Jennie Ray Greer (1872-1945) was married but living on Queen Street with the Wade H. McGhee family (her sister was married to McGhee) in the 1930 Census and on Queen Heights with the same family in the 1940 Census. 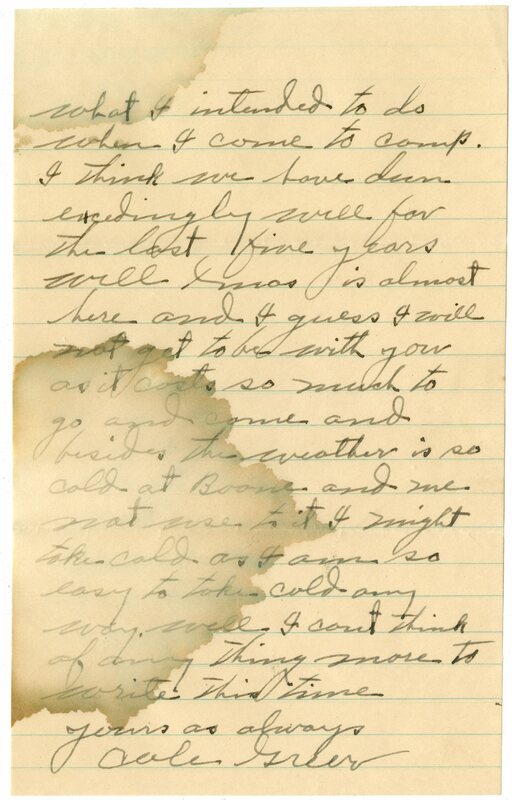 Cale Greer, “Letter, Cale Greer to Jennie Ray Greer, December 12, 1938,” Digital Watauga, accessed April 25, 2019, http://digitalwatauga.org/items/show/1203. 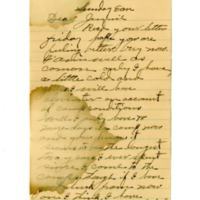 "The subjects of this letter are actually W. Cale Greer and his wife, Jane L. "Jennie" Ray Greer. Cale Greer and Jennie Ray were married in Watauga County in 1911. 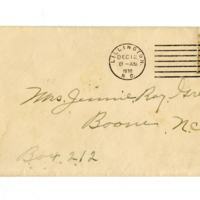 Jennie (1872-1945) lived in Boone but is buried in the Mathias Bledsoe Cemetery in Ashe County. She was a daughter of Thomas Ray & Mary A. "Polly" Horton. Jennie was a niece of former Watauga County sheriff Jack Horton and a first cousin to my great, great-grandfather, James Washington "Jim" Horton." This comment was originally made by Terry Harmon and appeared on digitalwatauga.omeka.net.